Three Adimec 25 Megapixel Offerings? Adimec offers three 25-megapixel cameras and you may be wondering what the differences are and why you would choose one over the other. If so, this blog is for you. Adimec offers a 25-megapixel (Mpx) 32 frame per second (fps) camera, one at 72-fps and one at 84-fps. The difference in frame rate might direct some customers to choose for 32 fps while others would go for the 72 or 84 fps. Why to choose between 72 or 84 might be less straight forward. Let us explain it. Some of the parameters may be foreign to you so let’s walk through them. 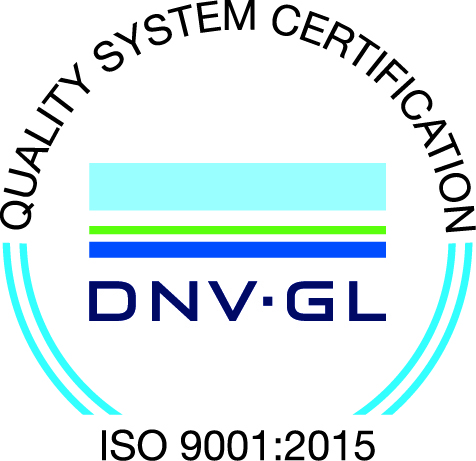 FWC – Full Well Capacity – is the depth of the well for the pixels and is related to shot noise, the higher the FWC the higher the maximum SNR, or signal to noise ratio. Lin, or linearity for both of these parameters means that we report only the linear portion of the curve, once it deviates from linear we don’t count it, which can make our numbers sometimes look worse than the numbers provided by the sensor manufacturers who often also count the non-linear part of the full well. Note that presenting the full well either way is correct, however it is important to keep in mind what you need in your application. The linear part everybody will be able to use, that’s why we mention it. The non linear part could be usable for one application but not for the other. Applications requiring a large full well and high SNR, shot noise limited applications might profit from the extra full well capacity in the non linear response region. This of course depend on how non linear the sensor behaves which is difficult to describe in a single number. Evaluating the camera would be the best approach to figure out if in your application you could live with the slightly non linear behavior of the sensor. Rn, or Read Noise, is the minimum sensitivity of the sensor. In essence, it is the minimum amount of sensitivity the sensor is responsive to. DNR, or dynamic range, is the maximum contrast, or brightest to darkest signal features discernible. The temporal sampling resolution can increase or decrease depending on the interface configuration. If you change the bit depth or region of interest, the maximum achievable frame rate could be influenced. PLS – is parasitic light sensitivity which is the effect where the next image is visible on the image being read out and this is the primary difference between the three cameras. 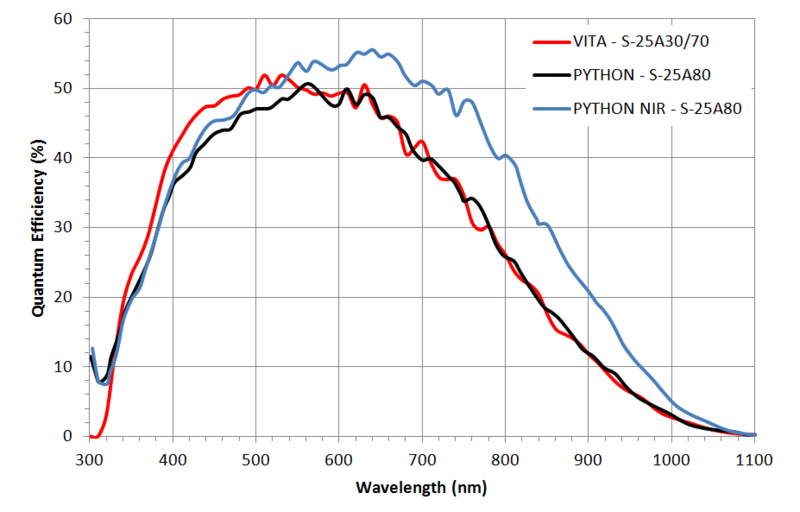 The smaller the number the better, so the PYTHON sensor is better compared with the VITA sensor. QE or Quantum Efficiency, describes how well a photon converts to electrons. 50% means that it takes two photons to generate one electron. This is a function of the sensor only. The figure below shows the quantum efficiency for the 3 cameras (2 sensor technologies). While the two sensors have identical QE at 600nm the differences on either side of that wavelength could be significant for your application, especially if it were at 300nm or 700 to 1000nm. 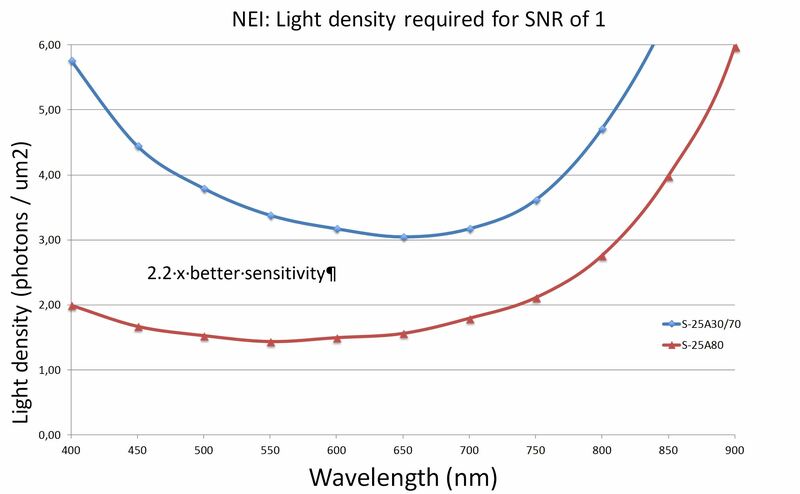 The absolute sensitivity threshold, which could be expressed as NEI (Noise Equivalent Irradiance), is the number of photons needed to get a signal equivalent to the noise floor of the camera. This absolute sensitivity is the combination of the sensor noise sources (in this example read noise and shot noise is included), Quantum Efficiency and pixel size dimension. In case the absolute sensitivity is compared between the 2 sensor technologies an absolute difference of 2.2 times is observed between the two sensor technologies at 600 nm. With identical pixel format and Quantum efficiency, the better sensitivity is related to the lower noise floor of the PYTHON25k image sensor. Now with all that behind us we can see that the choice of camera depends on the application or which parameters are most important to that application. Searching for a Frame Grabber? Where do I get CXP hybrid cables for my new frame grabber? CONNECTIONCONFIG: WHAT DOES IT MEAN?